Given the love most progressives have for Pope Francis, it’s odd for me to write a defense of his papacy. Especially as a gay man and as a mainline protestant minister. But there are progressive critics who raise important questions, which are worth addressing. And I’d like to explain, that despite those questions, I remain a fan of Pope Francis. On the one hand, it is easy to see why so many progressives love Pope Francis. He has spoken out on immigration and for refugees, sidelining the GOP and European anti immigrant parties. He has addressed poverty as a structural issue, an expression of an unjust economic system which concentrates wealth in the hands of the few. His first encyclical was on climate change and he is probably now the most visible spokesperson in support of responding to this issue. And he has campaigned against the death penalty and mass incarceration. 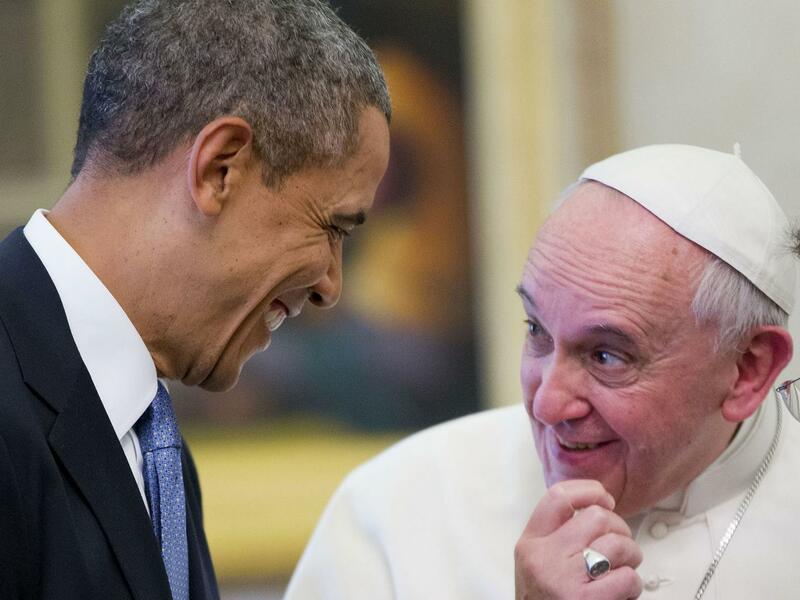 Issues progressives have tried to put on the national agenda are now receiving more coverage because of Pope Francis. And for those of us who are progressive Christians, it is nice to see the public face of Christianity not be the religious right, Kim Davis, Mike Huckabee, the Duck Dynasty, some assortment of televangelists or the modern GOP. At least this week, Christianity looks like Pope Francis, it looks like concern for the poor, environment, workers, and immigrants. It’s setting aside the culture war and tending to the least of these. So what is there to critique? Pope Francis still represents the Catholic Church. And while I’m not Catholic, my understanding is that official moral doctrines don’t officially change. And so despite what I’ve highlighted about Francis, it is still the case that under him, the Catholic church is in opposition to gay marriage, still sees transgender people as a problem, still opposes contraception, still opposes women’s ordination. As a gay man who is on the left, how can I sidestep these issues? Well they shouldn’t be side stepped. They should always be raised. The fact that I laud Pope Francis on poverty and climate change is not an indication that LGBT and gender equality issues are not important. It’s that I’m glad that there is some basis for common ground. I don’t expect to agree with people all the time. But when there can be common ground, it is worth highlighting. Imagine if our politics operated this way? But I think a more important consideration is missed in these critiques. And that is how Pope Francis, despite official doctrine, has shifted the debate within Catholicism. For instance, on LGBT issues, he has shifted away from it being a focus all together. Changing an emphasis means the church is less likely to be used in the culture wars against LGBT folks. He has also demoted church officials, including a cardinal, who have used their platforms against LGBT folks. One of more important powers a pope has, is appointments and over time that produces a structural shift in the church. The most important change, in the church, under Francis, is his effort to create free spaces by which progressives can organize. He overturned the Vatican’s efforts to investigate and ultimately take over the Leadership Conference of Women Religious, the umbrella organization for American nuns. Do you want to finds folks fighting for women’s ordination and LGBT equality as well as an assortment of progressive causes? Go to the nuns. That is why Benedict wanted to stop them. That is how change happens in the Catholic church. Sidelining the right, including folks working for equality, changing the personnel and the emphasis. It’s not flashy. It’s not even a Vatican 2. But what it does have is real importance for issues of equality. It does matter that Pope Francis is pope. That is not a call to stop critique but rather to notice the successes that are already being achieved under this pontiff. There is another critique raised though. Why should deference be given to someone simply for being a religious leader? What gives him some special authority that others do not have? Are we not simply feeding into the idea of religious privilege? If we are to ignore the pragmatic arguments about the head of a group representing a billion people in the world, whose voice does practically matter in peoples lives and well being, what else could be said? Maybe something like all voices are important. Yes Pope Francis has a big voice. But he does have the background and thinking that should be listened to. If we grant that the religious should not be given special deference, they should not be ignored either, simply for being religious. We’re told that religion is a human product. I agree it is. And if so, then our respective religious traditions have resources, ideas, talented people, that ought to be part of our conversation. He is also a Head of State. People forget that part.